Floats/vehicles should be constructed in dimensions that do not interfere with traffic control devices, roadway lighting, private property, etc. Participants should not stop unless the entire parade has otherwise stopped. Each parade participating group must be responsible not only for their own safety, but also for the safety of the public audience around them. Vehicle drivers are solely responsible for the safe operation of their vehicle. Candy, prizes, promotional items, etc., should be thrown away from the parade float/vehicle with enough distance that onlookers do not have to enter the roadway to retrieve them. Items should be thrown in an arching manner that does not target any individual. Promotional products made from paper may not be thrown or distributed. Participants may not spray liquids at the crowd. Alcoholic beverages should not be consumed on the parade route. Participants with horses or animals of any kind should each provide people to perform immediate excrement removal. Immediately bring to the attention of a parade official any unsafe or troublesome conditions along the parade route. Participants may not solicit attendees to enter the parade route. Each float/truck driver must be the holder of a valid driver’s license and must have valid Auto Liability Coverage in force. All floats/vehicles should be equipped with a fire extinguisher readily marked and available. 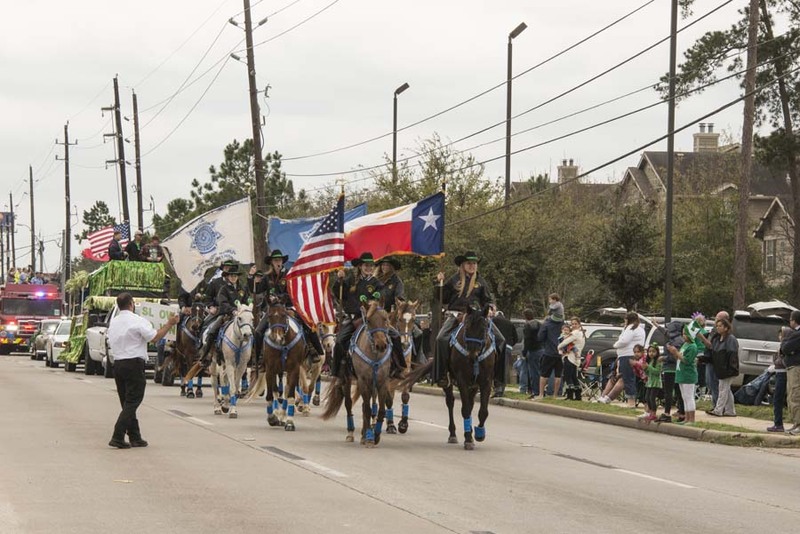 All participants must follow directions from authorized parade & law enforcement officials. This includes all uniformed public safety personnel and anyone else identifiable as a parade official. NOTICE: Attention all participants, spectators and vendors; for the safety of everyone, silly string, squirt guns and confetti are strictly prohibited by 1960 Parade Committee. • What is the fee to enter? The fee is $250 for the first vehicle and $100 for each additional. A vehicle with an attached trailer count as one. • Who do I make the check payable to and where do I send the check and entry form? Make checks payable to Cypress Creek EMS and mail to 7111 Five Forks Drive, Spring, TX 77379. For online registration click here. • What is the registration deadline? Forms and payment must be in our office no later than March 9th, 2017, 5 pm. To print an entry form click here. • What time do we show up on Parade Day? Registration begins at 10:00 am. While the parade does not begin until 2:00 pm, you need to arrive no later than noon as they begin closing FM 1960 shortly thereafter. • Where do we check in? Where is registration? To get to the check-in area, turn south on Champion Forest Dr. from FM 1960 (turn right if you’re coming from SH 249, turn left if you’re coming from IH-45). After you turn on Champion Forest Dr, you’ll see a driveway on your right about 50 yards from FM 1960. Turn right into this driveway and you’ve arrived at the check-in area (Wells Fargo parking lot). • Where do we get our float number? At check-in, you will be provided with your float number and directed to your designated set-up area where you will be parked prior to the parade. Most people show up early and spend several hours decorating their float on-site. • Will there be restroom facilities available? There will be porta-potties at the staging area. Yes, but the parade is about 3 miles long and so we suggest that if you intend to walk you include a vehicle that participants can use to rest if necessary. • Where can we obtain beads or candy to throw during the parade? Float judging will be based on originality, creativity, appearance, craftsmanship, crowd appeal and spirit.